Firano At Naples Homes: MOTIVATED SELLERS! Bring all offers. No construction wait. Beautiful, bright, and luxurious move-in ready Mediterranean Saviero Model in Toll Brothers Community, Firano. Built in 2014 with upgrades throughout, meticulously maintained. Fabulous 2 story Great Room with coffered ceiling next to a beautiful gourmet kitchen with stainless steel appliances. Open to the large screened in lanai and heated Salt Water Pool- perfect for entertaining! Large, private yard backing up to a preserve. Master Bedroom located on the first floor featuring coffered ceilings and customized walk-in closets. Master Bath includes dual vanities, private water closet, separate shower and roman tub. An additional bedroom with walk-in closet, full bath and study with wood floors completes the lower level. Upstairs includes two additional bedrooms, full bath, loft and expansive Bonus Room. Community offers pool, spa, fitness center, tot lot and clubhouse. Very close to downtown 5th Ave shopping, restaurants and pristine beaches! 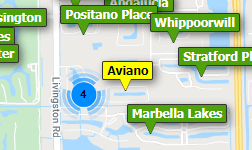 Need professional assistance selling your property at Firano At Naples Naples? Find out how an Area Specialist can help to generate more property exposure in order to get the most money for your investment in the least amount of time.